Is Stone A Good Idea For Your Bathroom Floor? There is absolutely no denying the raw beauty of stone. It can be breathtaking to walk into a bathroom with stone floors. Some of the most popular stones used in bathroom remodels include marble, granite, travertine, slate, onyx, and sandstone. However, beauty often comes with a price, and that can certainly be the case with stone. As lovely as it looks in the pictures, stone can be high maintenance. Make sure you fully understand the type of commitment that stone requires before moving forward with a stone floor bathroom remodel. Most stone surfaces can get very slippery when wet, which makes them a risky choice as a bathroom floor. Homeowners can mitigate this risk by using smaller pieces with more grout for traction or adding floor mats in the appropriate places. Of course, more grout means more grout cleaning, and too many mats may cover up a lot of your beautiful new flooring. Many kinds of natural stone, including different types of limestone and sandstone, are highly porous and require regular sealing. If you choose these bathroom surfaces, you will need to be careful about water and staining and will have to commit to an annual or even bi-annual sealing schedule. Stone isn’t as scratchproof as its hard surface may appear. Stiletto heels can leave their mark on marble and slate. If you have pets or children, your stone may not stay pristine for long! If you love the look of stone but worry about the upkeep of your future bathroom remodel, give us a call at USI Design & Remodeling. 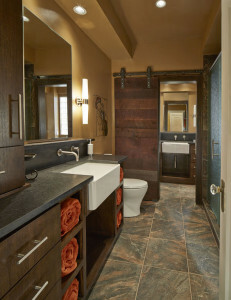 Our design experts can walk you through many different stone options until we find the perfect fit for your bathroom! Next Next post: Do you Need a Larger Kitchen for Entertaining?